Home / Blog / What is Droewors? When talking about South African food, traditional droëwors is one of the first things that springs to mind. The coriander-seed spiced dried sausages have always been a feast to the taste of food lovers. But, What is Droewors? It’s a is a 400-year old traditional South African beef snack, cured in a unique and highly nutritious way by the South African climate. It is different from Biltong, in both taste and preparation. Droewors (Droe Wors or Drywors) is an Afrikaans word which directly translates to “Dry Sausage”. It originates in South Africa and is the second most popular product we sell, just after biltong. Droewors is a dried version of the popular South African sausage, boerewors, (a delicious sausage spiced often with coriander seed), of which thinner boerewors sausages are dried to create droewors. The thinner boerewors sausage are usually chosen for drying as they dry more quickly and are far less likely to spoil during the drying process. Having said all this, the ingredients used to produce droewors do differ from traditional boerewors in that veal or pork are usually substituted for beef which is a more robust meat to dry. You won’t often find any curing agents in droewors either. It is usually dried quickly, to mimic the South African hot weather, and is unique among other dried meat and sausage for that very reason. 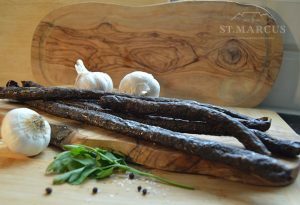 Italian cured sausages, for example, tend to be dried very slowly, and often contain curing agents to aid the process. So, what do you think? Get social and let us know on our social media!